This article is about the room on Frigate Orpheon. For the room on the Crashed Frigate, see Biotech Research Area 1 (Tallon Overworld). The Biotech Research Area 1 is a room on the Frigate Orpheon. Samus must go through this room twice: once while traversing the Frigate, and again while evacuating. 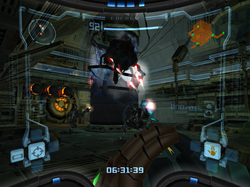 The first time Samus enters this room, she may access an upper walkway that wraps around a lower section containing three specimen cells, two of which are broken and empty. This walkway has two injured Space Pirates on it and wall terminals that can be scanned. When Samus returns to this room, she enters on the lower level. As she does, a Parasite Queen that was hibernating in the third specimen cell becomes volatile and attempts to escape. Three Space Pirates are trying to subdue it when an explosion kills them all. A damaged section of walkway allows Samus to climb up to the upper level again, where three more Space Pirates await her. An unstable ventilation cap breaks open, killing any nearby Pirates, exposing an escape route. Low life signs detected. The creature appears to be in a state of stasis hibernation. Transference of Phazon Batch 0081.0 complete. Rejection of Phazon Compound detected. Combat mutation applications are complete. The primary legs of this creature possess galvanized tips, allowing it to penetrate any known alloy. Parasite egg in pupa stage. Its tough exoskeleton protects it from its mother's acidic embryonic fluid. The fluid sacs in the mouth enlarge after mutation. This allows for increased production of corrosive bile. After mutation, the carapace of the larva becomes rigid. The carapace is quite resilient, able to resist the attacks of many predators. Status >> Both legs of this creature are broken. Status >> Severe internal damage detected. Status >> Minimal injuries assessed. Use caution. Maximum firepower recommended. The coils on this ventilation cap look unstable. This door has been sealed to prevent radiation leaks. Containment seal breached. Larva vital signs critical. Secure area and terminate specimen. This creature is deceased. Creature's incubation period was prematurely terminated. Its shell has not yet fully hardened. This page was last edited on 10 June 2013, at 00:42.